Spring is here and chances are your students are bubbling with energy. Why not put that energy to great use and start a school garden? April is National Garden Month and, thanks to the farm-to-table movement, school gardens are more popular than ever. Gardens are an excellent way to get kids moving, encourage healthy eating, and incorporate project-based learning into your curriculum. A school garden takes time and commitment, but in planning and raising a garden, you will sow seeds that will help your students reap a lifetime of rewards! Every good garden takes careful planning. The same is true for school gardens. In these times of tight budgets and resource allotments, you must first make your case for a garden before the administration or a school committee. School Garden Wizards offers resources to help you prepare and present your proposal. Once you gain approval, the work really begins! You will need community buy-in for labor and materials. This includes school staff, parents, local community partners, and most importantly – your students! Work with your students to develop a clear vision statement for the garden. Doing so will encourage students to take ownership of the garden and generate excitement for the project. Whole Kids Foundation and the American Heart Association offer an extensive School Gardens Activity Guide that aligns to national education standards. The Edible Schoolyard Project has a searchable database of teaching resources. Growing Minds maintains a database of Children’s Literature perfect for incorporating ELA standards with your gardening project. Life Lab offers downloadable Garden Science Exploration Units for grades 1 – 4. Eat Think Grow provides lesson plans for grades K – 5 for fall, winter, and spring. The National Agricultural Literacy Curriculum Matrix is a searchable database of agricultural lesson plans for K-12 teachers. The Great Garden Detective Adventure by the USDA is an eleven lesson curriculum on school gardening for students in grades 3 and 4. Farm to School offers a searchable resource database that includes a large select on school gardens. HelpTeaching.com offers life science and botany worksheets and plant related self-paced lessons including: The Fairy Tulips, Plant Reproduction, Vascular Plants, Plant Nutrition, and Photosynthesis. Once you have support from the school administration and the excitement of your students, it’s time to plot the garden! Get your students outside and walk the school grounds before selecting the garden location. Students can work in groups to develop proposals on where the garden should be located. They should consider the types of plants the class would like to grow, average amount of daily sunlight, proximity to a water source, space requirements, and soil quality. Groups can then present their proposals to the class and others involved in the project. Once a location is selected, students can use free online planning tools from Gardener’s Supply Company or Garden Planner to design the garden. A school garden can be decorative plants located by the school entrance or a full-grown vegetable garden. Don’t be intimidated by scale. Plan the type and size of garden that is right for your school and students. If you are tight on space and low on funds, start small and plant bulbs in the fall – the students will enjoy seeing them bloom in the spring. Herb gardens are wonderful for small spaces and produce a savory variety of flavors that can be shared with your school’s food service department. Likewise, if a full-bloom garden is too much to tackle, consider small container gardens or potted plants. Have your students cultivate potted gardens that sit by classroom windowsills. A bonus of small container gardens is students can take home and care for potted plants over the summer, eliminating the need for summer garden maintenance on school grounds. KidsGardening.org offers resources on container gardening to get you started. Although gardening is a reasonably affordable educational activity, there are still start-up and maintenance costs. Strong community buy-in at the school and local level should help bring in donations and minimize expenditures. However, there are grant opportunities and seed donation programs to help offset costs. These organizations offer or have offered grants or seeds in the past for school garden programs. Grant terms and deadlines vary, so read guidelines and eligibility requirements closely. 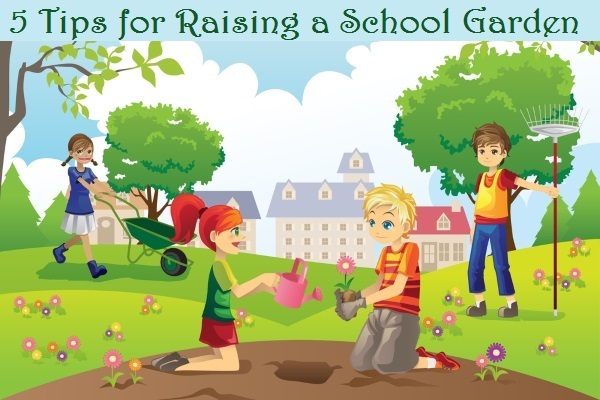 You can also look for local grant opportunities, companies that donate seeds, and consider fundraising projects like selling seedlings grown by your students. A local hardward store or landscaping company may be willing to donate materials or labor to help make your garden a reality, but you’ll never know if you don’t ask. Happy gardening! Looking for more green activities for your students or children? Read 10 Engaging Earth Day Activities for Kids and America Recycles Day Activity Guide.